Backed by affluent industry acquaintance, we are offering Milk Powder Container. As a pioneered firm engaged in manufacturing Stainless Steel Milk Container, strive to ensure our clients guaranteed satisfactions by providing them products that is best in the industry. These are made with the best quality raw materials which are according to the set international quality standard. 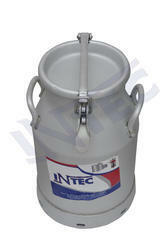 We have gained a huge appreciation in the market by offering an excellent array of 25 Liter Milking Bucket. We have been manufacturing and exporting a variety of Milk Buckets.